Back in 1994 we lived in Northridge, California. On January 16, 1994 I spent the day setting up banquet tables in my dining room and living room so I could empty out EVERY kitchen cabinet and drawer of dishes, food (including 6 dozen freshly made jars of jam) and cooking utensils onto those tables to prepare for a complete kitchen overhaul. It was a tough job and in all honesty some things were stacked a bit precariously, but I made it ALL fit onto the tables. After I accomplished that tiresome job I removed all the cabinet doors and had them stacked and ready for stripping and painting the next day. I was exhausted, but I was ready for the next day full of painting. Or so I thought. What I didn't know when I planned that project was that the 6.9 Northridge earthquake was going to strike at 4:31 the next morning, only a few short hours after I called it a day from the prep work for the kitchen the previous day. Long story short we lost 95% of EVERYTHING in the house and garage including my car. It took a FULL month plus to pick up, bag up, box up and haul everything out to the curb to throw away the broken pieces of our life including furniture, walls and the jam mashed into the carpet. We had no food except what was in the freezer. We had a 2 week long block party with the neighbors all taking turns at cooking on BBQ's in the street. No electricity, no stores, no banks, no phones (the days before everyone having a cell phone)... life came to a grinding halt. But, when the dust had settled, the insurance inventories had been submitted, insurance checks began to arrive and when we had caught our breath we began rebuilding. One of the first things I bought was a new mixer. I had decided that I was going to splurge and so I bought a top of the line (for the time) 6 qt. professional Kitchenaid. At the time you couldn't get all the designer colors so I got a simple white. 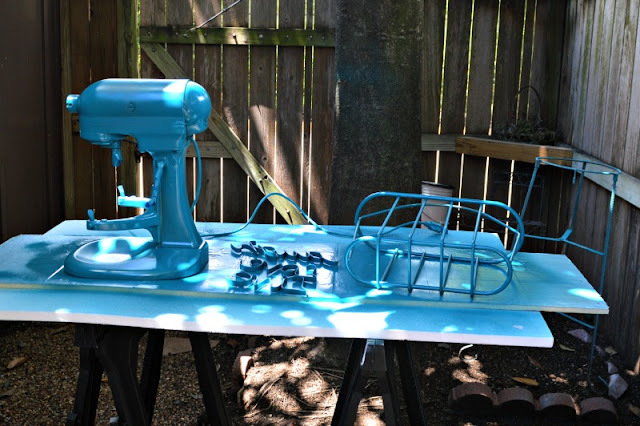 In early 2007 I couldn't stand how it looked after so many years of use, but it is a work horse and I love it so I decided to paint it. 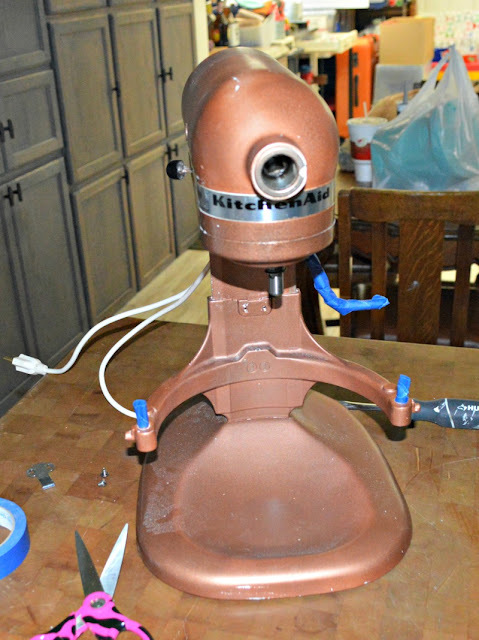 No since in spending money just for a prettier mixer so I chose a hammered copper paint which was popular for the time. Now, lmost 10 years later it was time again. This time I chose a teal color to keep with the color theme I have chosen for this house. Teal is my new favorite color since it's the awareness color for Ovarian Cancer. A day doesn't go by that I don't thank God for surviving Ovarian Cancer so choosing the teal is a happy reminder that I'm here and healthy. I got a little carried away and started painted a lot of things. Of course it began to thunder and sprinkle then rain so I had to move everything inside to finish drying. All finished! 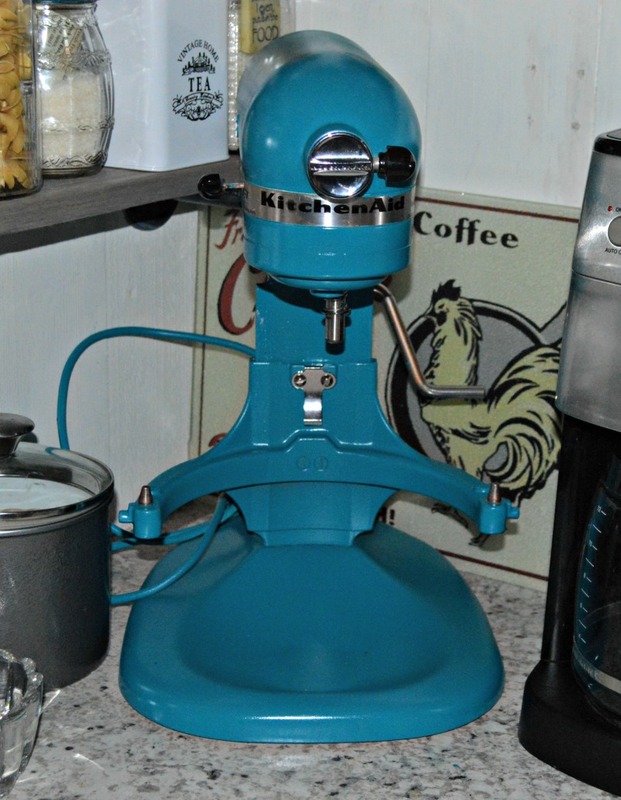 A great 22 1/2 year old KitchenAid professional workhorse in a new custom color. It looks great. 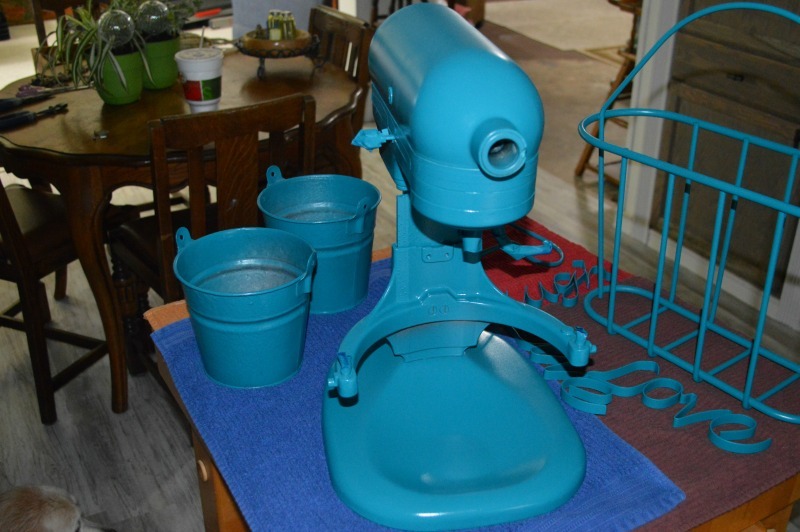 I was really curious about this post since I've had my kitchen aid for 15 years and was thinking yours had perhaps broken. I see those cute new ones all the time (mine is white also) and have never thought of trying to paint my own. What a great idea! Give a try. I think you'll be very happy. Brand new for a $3.97 can of paint!